The strong and deeply affectionate bond between the British and the Gurkha people extends back to 1815 when the Gurkhas were first enlisted into the armies of the crown; the British military preferring to fight with, rather than against, such a terrifying foe. During the 19th century the Gurkhas fought in the Indian Mutiny, the second Afghan war and the Boxer Rebellion in China developing their reputation for bravery and loyalty. In the First and Second World War over 200,000 Gurkhas served and they suffered huge casualties. Almost 45,000 were either killed, wounded or missing in action and they earned thousands of gallantry awards. Since the Second World War the Gurkhas have continued to serve around the world including the jungles of Borneo and Malay as well as in the Falklands conflict in 1982. More recently they have seen active service in Sierra Leone, Iraq and Afghanistan. Throughout, the Gurkha war cry of "Ayo Gurkhali!" and their fearsome kukri knives have struck terror into the hearts of their enemies and many battles have seemingly been won even before they set foot on the battlefield. Stories of their indomitable spirit and immense courage have become legendary along with their motto “Better to die than be a coward”. Young men from the Pokhara region can apply to enter the British, Indian or Nepalese armies but becoming a Gurkha soldier in the British Army is still a matter of immense pride. Thousands apply every year, but few are accepted. The rigorous selection takes place at the British Gurkha Camp in Pokhara which Prince Harry will visit. The selection process includes English grammar and math tests, initiative and medical assessments and interviews with serving officers. Candidates also face gruelling fitness tests including a 'doko race', which involves carrying 25kg of sand while running up a steep 4.2km course. The few who pass find themselves at Catterick Garrison in North Yorkshire, where a rigorous nine-month training course covers language, military skills, and instruction on Western customs and Regimental culture. After passing out, they will join a regiment or unit in which they will serve for the rest of their military career. Since the high profile campaign fronted by Joanna Lumley in the 1990s, Gurkhas and their families have gained the right to settle in the UK at the end of their service and they have also secured equal pension rights to British service personnel. Prior to this, Gurkhas often suffered high levels of hardship and poverty when returning to Nepal. To help relieve poverty and distress among ex-Gurkha soldiers and their dependents The Gurkha Welfare Trust was established in 1969. Today, their important work continues with the provision of educational, medical and water facilities to remote Gurkha communities. They have also played an essential role in rebuilding homes, lives and schools following the devastating earthquake of April 2015. Prince Harry will trek in the Annapurnas and see some of their projects first-hand including a rebuilt school and village homes. The Prince's spokesperson said "how much he has been moved by the stories of resilience of the Nepali people following the earthquakes last year,” and that "he is very much looking forward to getting to know some of the people living in the foothills of the Himalaya". Mountain Kingdoms is a corporate partner of The Gurkha Welfare Trust and will continue to raise funds on their behalf to help support their immensely valuable work. 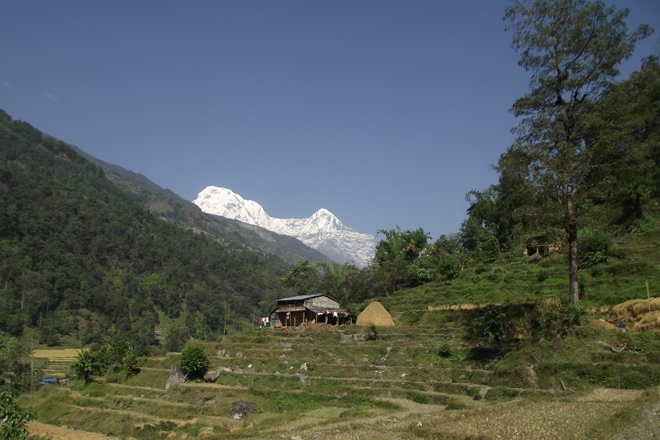 If you would like to trek in the same area of the Annapurnas as the Prince then take a look at our Gentle Trekking & Luxury Lodges, Annapurna Foothills trekking holiday, Annapurna Sanctuary trek or Annapurna Base Camp in Style.